This election, we’ve heard a lot about divisions that define America. First it was the 99 percent and the 1 percent. Then it was the moochers and the makers. Politicians, of course, love to claim that we are more than the sum of our differences, but the dividers actually have a point. In all kinds of real and practical ways, the United States today is not one nation, but two. 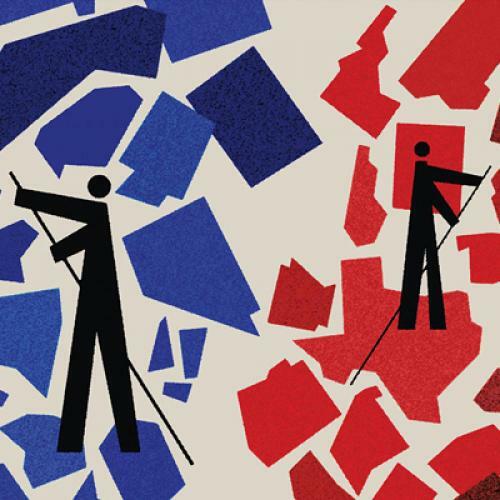 We’ve come to think of “blue” and “red” states as political and cultural categories. The rift, though, goes much deeper than partisan differences of opinion. The borders of the United States contain two different forms of government, based on two different visions of the social contract. In blue America, state government costs more—and it spends more to ensure that everybody can pay for basic necessities such as food, housing, and health care. It invests more heavily in the long-term welfare of its population, with better-funded public schools, subsidized day care, and support for people with disabilities. In some cases, in fact, state lawmakers have decided that the social contract provided by the federal government is not generous enough. It was a blue state that first established universal health insurance and, today, it is a handful of blue states that offer paid family and medical leave. Americans have been arguing over which system is morally and economically superior since the beginning of the republic. But every now and then, the worldviews have clashed and forced a reckoning. The 2012 election is one of those moments. One of the campaign’s most contentious issues is the Affordable Care Act (ACA)—the legislation that finally mended a gaping hole in the American safety net. Yet already this year, more than a dozen Republican governors have called upon their states to reject or resist the ACA. If they get their way, Americans living in states that implement the ACA will effectively have a right to health insurance. Americans living in the anti-ACA states would not. Now, Mitt Romney and Paul Ryan are vowing not only to repeal the ACA altogether, but to turn vast swaths of public policy—including Medicaid, food stamps, and housing—over to the states. This promise gets little attention, but it is one of the most radical parts of their agenda. It would entail a massive transfer of authority away from Washington, arguably unprecedented in U.S. history, in which states would get a lot less federal money for welfare programs and a lot more power over how big those programs should be. The blue states might scrape up the money to replace existing federal funds on their own. Red states would almost surely seize the opportunity to pare back the already meager assistance they provide. Tens of millions of Americans would likely lose health insurance. Millions more would likely lose access to food stamps, the program that has become the primary safety net during the Great Recession. About a century later, a wave of immigrants from central, southern, and eastern Europe arrived in the Northeast and upper Midwest, grafting Catholic notions of social justice and Jewish notions of social responsibility onto the old Yankee sense of mutual obligation. By that time, the industrial revolution was forcing governments in the Northeast and upper Midwest to confront problems of urban poverty and gross labor abuses. Many historians argue that this stew of culture and circumstance helped to create the prototypes for the reforms of the Progressive era and, later, the New Deal—whether it was the minimum wage, which started as a state law in Massachusetts, or Social Security, which was partly based on a public pension program in Wisconsin. The South was slower to industrialize and slower to take measures to protect the vulnerable. By the time of the Great Depression, most Southern state governments did not provide any form of cash assistance to people in poverty. One likely reason was the region’s own equally distinctive colonial ancestry. Appalachia had attracted fiercely individualistic immigrants from the Scottish and Irish woodlands. Virginia’s founders, meanwhile, were a group of well-educated elites who, unlike the Puritans, wanted to recreate the society they left behind, including its class divisions. People in the South had a “downright aversion to any actual exercise of authority beyond the barest minimum,” W.J. Cash explained in his 1941 classic, The Mind of the South. And as Fischer notes, public spending and taxes in prerevolutionary Virginia were half of what they were in Massachusetts; in Appalachia, the numbers were lower still. But something else had soured the South on social welfare: race. Programs to help poor people were, inevitably, programs to help African Americans. Southern whites wanted nothing to do with helping former slaves get an equal footing in society. They did embrace the New Deal, in part because Franklin Roosevelt and his allies went out of their way to accommodate their racial sensibilities: Social Security, for example, initially exempted agricultural and domestic workers. By the 1950s, however, the South was once more under attack for its denial of civil rights to African Americans. Later, it came to see the anti-poverty programs of Lyndon Johnson’s Great Society as yet another effort to redistribute money to blacks (even though, like the New Deal, it also helped many whites). In national politics, champions of the Southern worldview advocated a restoration of power to the states—by, among other things, shrinking the size and scope of the welfare state. They quickly found allies in the increasingly conservative Republican Party, which was launching a counterrevolution against big government. Plenty of Northern whites, it turned out, shared the antipathy toward the War on Poverty. In the 1980s, Ronald Reagan made “devolution” part of his agenda, attempting (unsuccessfully) to turn food stamps over to the states and (successfully) to nominate federal judges who thought the U.S. Constitution dramatically curbs federal power. The biggest victory for these counterrevolutionaries came in 1996, when Republicans passed a bill, signed by Bill Clinton, to “end welfare as we know it.” The legislation gave states wide leeway over how to manage benefits and, over time, gave them less money to spend. Another major triumph came this summer, when the Supreme Court ruled that the ACA’s expansion of Medicaid was “coercive” and made it easier for states to opt out of that part of the law. Among the first governors to welcome the ruling was Texas Republican Rick Perry, who characterized President Obama’s health care reforms as “brazen intrusions into the sovereignty of our state.” This was fitting, because, just as Massachusetts is the model for the blue state, Texas is the model for the red. Blue states also invest a higher proportion of their budget on safety net spending, according to a study compiled by Curtis Skinner, director of family economic security at the National Center for Children in Poverty. This category includes major, means-tested programs like Medicaid and Temporary Assistance for Needy Families, as well as smaller programs for foster care, homeless shelters, and so on. The ten “highest expenditure” states are blue states; eight of the ten “lowest expenditure states” are red. The easiest way to grasp what this means for the actual residents of red and blue America is to look at Medicaid. Although the federal government sets minimum standards for coverage and benefits, states have discretion over how many additional people to include. Based on data compiled by the Kaiser Family Foundation, the five states with the strictest criteria for working parents are Arkansas, Alabama, Indiana, Louisiana, and Texas. The five states with the least restrictive requirements are Minnesota, Connecticut, Maine, Vermont, and Wisconsin. A Minnesota mom with two kids and a job that doesn’t offer health insurance can get Medicaid as long her annual income doesn’t exceed about $40,000. But if she moves to Arkansas, she’ll be ineligible for Medicaid as soon as her household income reaches $3,150 a year—not nearly enough to pay for basic living costs, let alone health insurance. If Rick Perry wants to strip the Texas welfare state bare, why should voters in Maine or Oregon care? If anything, the blue states would probably benefit from such a move. Since red states have more poor people, and since their state governments spend less money on the safety net, they receive a larger share of federal funds. Among states that voted Republican in the last three elections, all but one gets more money back from the federal government than it pays in taxes. For most Democratic states, it’s the opposite. Looked at this way, the red states are the moochers and the blue states are the makers. But reformers and progressives in the blue states have never been content to ignore what’s happening in other parts of the country. In the nineteenth century, this meant that an African American shouldn’t be a slave just because he lives in South Carolina rather than Vermont. In the twentieth century, it meant that an African American shouldn’t be dispatched to the back of the bus—or barred from entering the voting booth—because she called Birmingham, not Boston, home. The United States was one country, with one set of rights. No state or section had the right to take those away. Restricting access to public assistance and programs obviously isn’t on the same moral plane as denying people the right to vote or holding them as slaves. But these things should weigh on our consciences all the same. Food stamps keep people from going hungry. Unemployment checks prevent people from losing their homes. Health insurance keeps people from suffering and dying. Food, shelter, medicine—these are basic needs to which all people, and certainly all Americans, should be entitled. Over the course of the last century, from the Progressive era through the New Deal and Great Society, the United States slowly but surely moved toward guaranteeing those things. Giving the red states the power to deviate from this course means giving them the right to undo that progress. Advocates for the red-state approach to government invoke lofty principles: By resisting federal programs and defying federal laws, they say, they are standing up for liberty. These were the same arguments that the original red-staters made in the 1800s, before the Civil War, and in the 1900s, before the Civil Rights movement. Now, as then, the liberty the red states seek is the liberty to let a whole class of citizens suffer. That’s not something the rest of us should tolerate. This country has room for different approaches to policy. It doesn’t have room for different standards of human decency.